As reported today in the press release of the Nobel Committee, two outstanding scientists, whose discoveries formed the basis of modern cancer immunotherapy, became laureates of the 2018 award in the field of physiology and medicine. 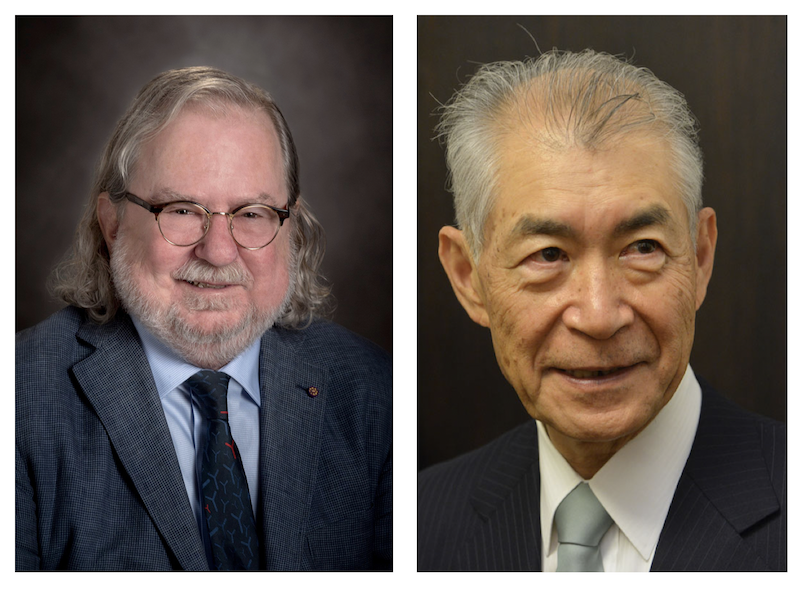 The prize was awarded to James P. Allison (USA) and Tasuku Honjo (Japan) for their discovery of cancer therapy by inhibition of negative immune regulation. The human immune system works by the “self/non-self” principle, attacking foreign elements (non-self) and remaining neutral to its own cells (self). This precise control is maintained due to the complex balance of activating and inhibiting proteins on the surface of immune cells. In the case of a malignant tumor, inhibitory proteins can play a negative role, suppressing the activity of antitumor immunity. James P. Allison, working in the 1990’s at the University of California, Berkeley and studying one of the inhibitory proteins, CTLA-4, located on the surface of T-cells, came to the conclusion that by blocking its function with an antibody, it is possible to release the antitumor activity of the immune system. The first research results in animal models were very promising, and already in 2011, based on data from the clinical study in patients with advanced melanoma, the first in class checkpoint inhibitor was approved. In several patients in the clinical study signs of remaining cancer disappeared; such results had never been seen before in this patient group. In parallel, Tasuku Honjo at the University of Kyoto discovered another protein on the surface of T-cells, PD-1, which had a similar inhibitory role, but via another mechanism. This discovery led to the development of several therapeutic antibodies, the clinical studies of which have demonstrated efficacy in the treatment of patients with various metastatic tumors (including kidney cancer, melanoma, lung cancer, lymphoma), resulting in long-term remission and even possible cure in several patients. One of these drugs is currently approved for the treatment of patients whose tumors have a certain genetic feature, rather than based on the location where the tumor originated. This is the first approval of this kind in oncology. This is not the first Nobel Prize awarded for the achievements in the field of antitumor therapy: in 1966 Huggins received it for hormone treatment for prostate cancer, in 1988 Elion and Hitchins – for chemotherapy, and in 1990 Thomas – for bone marrow transplantation for leukemia. Each of these discoveries, including this year laureates’, has formed a separate pillar, on which modern cancer treatment is based. The official ceremony of Nobel laureates awarding will take place traditionally in Stockholm on December 10, 2018.